Spent the last two months eating blueberries, blackberries and walnuts just about EVERY morning for breakfast!! The results have been amazing. Low calorie high nutrient content has left me feeling very satisfied and energetic! Lots more energy. And very good digestion. A few weeks back I decided I could no longer continue to do this! It took me nearly half an hour to down my big bowl!! That was about half cup of each item. All of that chewing I thought was for the bears! So recently I decided to make smoothies. Sipping them was much easier plus my teeth and lips would not be a deep blue!! Voila!! What you see above is the finish product. Today I decided to stick with just the Wild Maine blueberries!! So it is half cup of walnuts that first I pureed in the blender with half cup water. Then I added one date (remove the seed first!). I added one full cup blueberries and one teaspoon raw honey. Set blender to puree for at least one minute. Then I added one 11g scoop of fibre mix that has ground flaxseed, ground oat bran and ground acacia. And the one teaspoon of super green powder. Oh and 1 cup of water. All I can say is YUM...for the tummy and for the health. 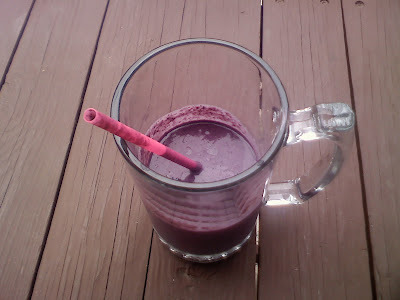 Smoothies are much better ways to get those nutrients in and its very satisfying.